Greg: Good morning, Jason. How are you? Jason: I’m doing great today, Greg. How about yourself? Greg: I’m doing all right. I feel a little bad. We got into the podcast. We’ve been talking about kitchens and I feel like maybe we skipped sort of an introduction, maybe something we should have talked about earlier. You’re a custom home builder, a custom luxury home builder. I’ve talked like everyone knows exactly what that means here in the Louisville market. Maybe let’s go backwards a little bit and help define exactly what kind of homes we’re talking about, maybe the process, how it’s different from a different process. To you, what does it mean being a custom home builder or a luxury home builder? Jason: Well, I guess in the Louisville area, when you think of a custom luxury builder, I think typically you’re going to look at a house that’s valued at $1 million or more. I think that’s kind of a basic starting point in that group of luxury custom homes. Greg: Has it been that number, in your mind, for as long as you’ve been building or is that sort of a creep number that moves as the economy improves or declines and houses are built? Has it always been around a million? Jason: You know, it’s probably creeped a little bit over the years as costs have gone up, but I think that million threshold has probably been a pretty good number for a while now. Greg: That’s for the Louisville market, right? Certainly there are some markets in some cities around the country that a million dollars doesn’t buy what it buys here in Louisville. Jason: Yeah. If you’re in LA or New York City, a million bucks probably isn’t going to get you what it’s going to get you here in Louisville. We’re very fortunate to have such great quality homes that you can get in the Louisville area. Greg: When someone talks about luxury, is it usually only a sticker number or in your mind, are you thinking different level of finishes so you could have a luxury feel in a smaller house or less expensive house or does it all go together for you? Jason: I think it’s kind of a hybrid type approach. There’s different elements that are going to make up a custom home. Some of the big drivers, sometimes might be the lot cost or the land value. You could have a $500 thousand parcel of land in Glenview, Kentucky, for example, that you put a $500 thousand house on there. All of a sudden, you have a million dollar home that may not be the typical luxury custom home that people might think about. Jason: When I think of higher-end homes, I’m thinking of homes that usually 4,000 square feet or larger. Jason: You know, most all of them are going to have a first floor master, large kitchen, big walk-in pantry, a lot of high-end built-in appliances like Wolf and Thermador, even some GE monogram here locally. Greg: You mentioned … Sorry, go ahead. Jason: You know, usually you’re going to have a minimum of three car garage, even a lot of our luxury custom homes nowadays are going to a four car garage. Greg: I can’t believe these young kids want to drive nowadays. It’s kind of mind-boggling, isn’t it? They want their own car and their own space. Greg: You don’t want them in the driveway anymore. Greg: I know it. You mentioned first floor master. I was just curious. Is that a function of being a luxury home or do you find that when people get to that point in their life that they can afford a home of this price tag, that they’re also at a point in their life where first floor master makes more sense for them? Or is it the same question? Jason: I think it’s a similar question, but it depends on location. We do a lot of luxury homes in Norton Commons, for example, where we still do have second floor masters, but that’s probably one of the few locations that I’m building million dollar luxury homes with second floor masters. Jason: When we go out to the Prospect area or some of those Glenview spots, almost always, I think it’s a lifestyle change. People want that first floor master. A lot of times, kids may be grown, but the kids aren’t necessarily grown. The parents like to have that space between the floors so they can put the kiddos to bed at night, come down have a little bit of peace and quiet on the first floor. Greg: Okay. Cool. Then, also, you’re talking about custom luxury building. What does custom mean to you? Is that a process where you’re actually listening to what they want, so it’s a one-on-one sort of an artistic approach. Is that what that means to you? 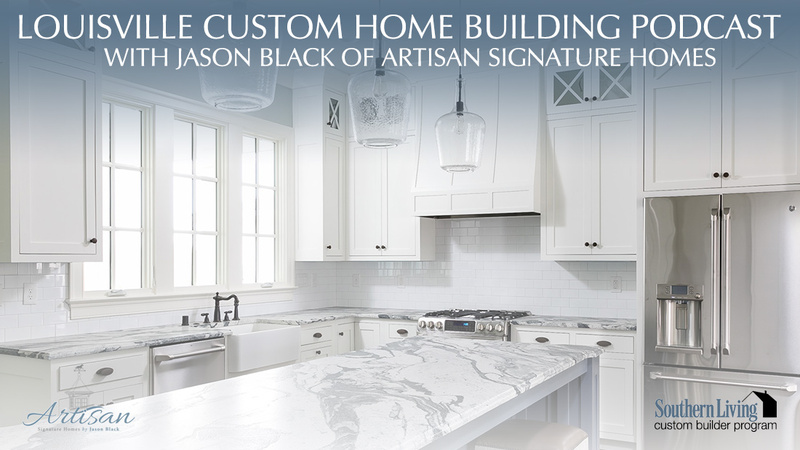 Jason: Well, with the name of my new company, Artisan Signature Homes, I do feel like there is an art to coming up with a custom home. If somebody comes and wants and build a new home with me, I may show them some plans that I’ve built in the past, but almost never do I rebuild the same custom home for another client. There is a process involved. It takes a little bit of time. When you’re talking this price range, it may take us anywhere from three to six months or longer to actually design the floor plans and elevations of the plan. It’s a little bit of a back and forth process. I sit down with the client at the first meeting and we just start talking. I want to understand what their lifestyle is, what their needs are. From that initial meeting, I’ll sit with my architect and we’ll just sketch up some concepts and we’ll present it to the client. Greg: Does someone typically already have a lot in mind where they want to build so that you can match the house to the property or does someone approach you and just say, “I’ve heard of you. I want you to build my house”? And then you go find a lot from there. Jason: Well, it’s a little bit of both. I usually never design a house until I have a lot in mind. Jason: Then, a lot of customers will come to me, they’ve seen my work or know my reputation and I’ll help them find the lot. The other half, they may already had a lot, they’ve had it for a few years or they’ve just purchased it and then I’ll help them from that point forward. Jason: Yeah. It can be sometimes as little as two to three months, but it could be three to six months. Again, it’s a lot of times people are building a house like this, they want to put a lot of effort into it. We may involve their interior designer on the design of the floor plans to make sure the furniture fits. The back and forth goes, when I have that first initial meeting with the client to deliver them plans, there’s usually about a two or three week lag time. Once I deliver the first set of plans, it’s usually never perfect on the first go around because we’re taking a lot of their concepts, trying to put them on paper. We may get a good portion of them correct, but it may not be 100% correct. Jason: Yeah. Once they actually see it on paper, and it really becomes their house at this point. Until this point, it’s always been pictures and floor plans from maybe Southern Living or some house plan magazine, Traditional Home or something like that. But until that plan is actually theirs, on their lot, they’re seeing it, then it becomes real. That’s when we really start tweaking. Once we have that initial plan, we’ll start tweaking and adding and changing and moving walls and moving rooms and maybe opening the kitchen up. It just evolves. There’s a little bit more back and forth. Greg: Okay. It probably depends upon the clients too. Some people are going to be right on top of it. Some are going to be a little bit slower. You give yourself … They set the pace, right? You can’t really make a client go as fast as you want to go. Jason: No. That’s exactly right. I’ll have clients that I’ll meet with. They’ll give me feedback within a day or two. Jason: Then, I’ll have clients that will take several weeks to get back to me. They’ll come back and sometimes they’ll have sketched and layered and kind of put their own interpretation of the floor plan, just so we can have an idea of, when I get back together with my architect, how we can put the next version in place. You know, I’ll usually like to start with the first floor plan only. Again, that’s with a larger home. Jason: A home that’s 4,000 plus square feet. The first floor could be anywhere from 3,000 to 4 or 5,000 square feet on the first floor. It doesn’t make a whole lot of sense to draw a second floor and elevations on a house like that. We draw the first floor, we tweak it till we get it right, and then we move onto the second floor. Then we’ll move on to the elevations. Greg: The elevations, that’s basically the drawings of what the house is going to look like. It’s a sketch, right? Jason: So sketch of the elevation. We may do a color rendering to give them an idea or dimensional drawings of how that elevation’s going to look, maybe put some texture on there. Brick and stone versus siding. Greg: Okay. When you get the drawings done, what’s the next step? Greg: When do they sign a contract? You’re doing all the drawings before a contract is signed? Jason: Yes. We do a design deposit upfront before we start on the design. Then, we’ll do all the pre-work, all the bidding out, during the, it’s still the design phase, budget design phase. Once we’ve agreed upon the specifications, the bid set of drawings, we go into the contract phase. Once we sign a contract, usually we’ll get a deposit of like 10% of the purchase price. Then we’ll complete the construction drawings and usually be ready to go within a couple weeks to kind of get a hole in the ground. Greg: Okay. Without getting too personal or asking about your income, how does a home like this get financed? Is the client financing through a bank and then the bank’s okay doing these draws that you’re talking about? The bank will let them take a piece of the loan and do the initial 10% and then later you’ll ask for a little bit more as you get further in the house. Jason: Yes. Again, as every custom house I’ve built is different, every person’s financial situation is different. I’ve built multi-million dollar houses that were paid out of cash from the client. Greg: Line of credit or something. Jason: Yeah. Line of credit down. When we go to actually do the signed contract and the construction loan, the homeowner, most of the time, will deed me over the lot. Artisan takes possession of the lot and then I go to my lender and get a loan. Jason: A construction loan. Usually, my lender’s going to require a 10% deposit down. That’s what I’m getting from the customer. I take care of the rest. Greg: Okay. Then you build the house and then at the very end, when it’s ready, you basically sell it back to the client and then they take the deed back from you. Jason: That’s correct. That’s the majority of the case where the customer’s going to buy it back from me. There’s a transfer from say Artisan Signature Homes to Greg. Jason: The other option is sometimes the customer wants to maintain ownership of the land and they will actually do the financing and carry the construction loan. They just most of their lenders will make sure that their builders are on an approved list, they’ve got a great reputation. Greg: Basically, what you’re telling me is if somebody wants to buy a luxury home, you’ll help them make it happen. Greg: There’s a way to make it work. Jason: We’re flexible. We can work it if they want to take the loan or we take the loan. Absolutely. Greg: So you’ve got the drawings, you’ve got the deposit. In a dream scenario, I understand all clients are different. If somebody doesn’t make a whole bunch of changes to the house as you’re building it, what kind of process are we talking about? What kind of length of time? This is a substantial house. This is not going to be a … I’ve seen some houses go up in three or four months. I’m guessing this isn’t’ the case here. Jason: Yeah. Homes I’ve built don’t take three or four months. Jason: You know, six months is the shortest that I could ever build a house in. On average, it’s a ten to twelve month process. Some of the larger homes we do can be up to fifteen to sixteen months. Again, it just depends on the scale of the project. You know, if you’ve got pools involved or we’ve done some like tennis courts and gymnasiums. All those fun things add that other layer of difficulty. Usually, when it’s a little bit more difficult, it takes a little bit more time. Greg: Okay. Wow. It’s quite … By the time someone first initiates contact with you all the way through say one of the larger houses, you could be anywhere up to two years. Jason: We usually don’t build this level of home on a specular basis. It’s people are coming, they’ve seen our work in the past, and we help design and craft their beautiful new home. Greg: Okay. That’s kind of a bummer. If I do want to go out and see something that you’ve built, you have a couple projects coming up that I might get the chance to visit, right? Jason: We do. We’ve got several new contract homes coming up that actually are going to be featured on tours. We’ve got a, first ever to Louisville, Southern Living Showcase home that will be in Norton Commons. It actually falls into that luxury home category. It’s going to be about over 6,000 square foot, million dollar plus home. Jason: That will have all the bells and whistles that we’ve been talking about. We also have a Homearama in Norton Commons in 2016, next summer in July. We’re going to have another home that will have some great features to it that it may not quite qualify for the for the luxury homes that we’ve talked about, but it’s going to be a showstopper. It will definitely be something that the listeners will want to check out. Greg: Well, great. I think we’re coming up on the end of the show, but I wanted to ask you when you do something like Homearama or the showcase house, someone can buy it ahead of time, right? Do you have to get their permission to let everyone walk through or do they sort of buy it knowing that this is the deal that people are going to come through and if you’re going to get your feelings hurt, don’t buy it? What is that kind of relationship? Jason: We definitely make the homeowners aware that there’s going to be a lot of people coming through. While everybody might love the house, there’s always going to be a few that may not. Jason: So you’ve got to have a little bit of thick skin if you’re going to hang around the house. But we do, we let them know that there will be some traffic coming through the house. They’re going to get the benefit of a Homearama house. There’s always some substantial increased value of a Homearama house. Greg: You mean later on. What is the increased value? Greg: So they can put their tag on the home so when the people come through, the people see blank plumber or blank fixers. Jason: We valued Homearama houses in the past. It’s usually a minimum of $50 thousand bargain or potential upside for the homeowner. Greg: All right. I’m looking forward to it. As always, I appreciate your time. I’ll see you next week. Jason: All right. Sounds good, Greg. I enjoyed it.